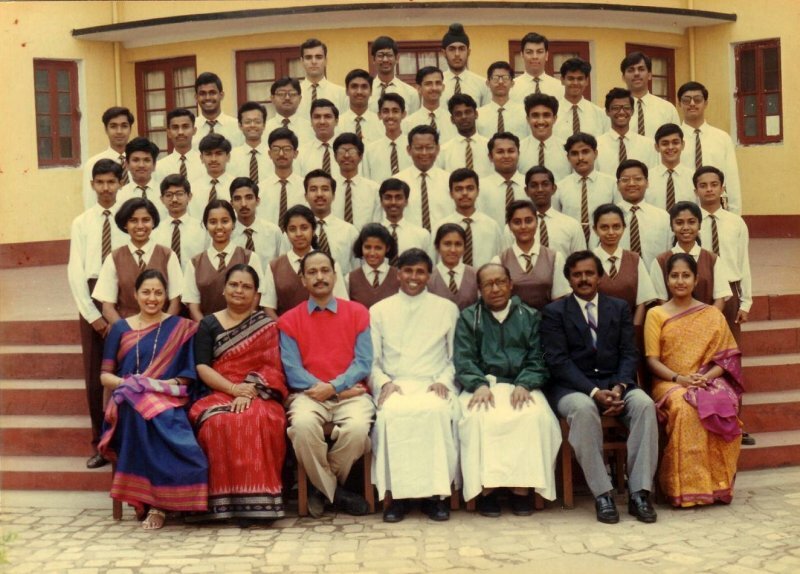 Row One (Bottom): Ethics Mrs Pamela Mathias, Physics Mrs J Dasgupta, Mathematics Mr C Natarajan, Principal The Reverend Pius Fernandes SJ, Vice-Principal (Our beloved) Reverend George Thana SJ, English Mr Philip Chalil, Chemistry Mrs V Menon. Row Two: TP Shama, Nisha Nair, Saina Kuriakose, Subhalakshmi Ghosh, Shalini Gadia, Anima Baranwal, Bipasha Kar, Sonali Sinha. Row Three: Anshuman Ghosh, Saurabh Sinha, Mahesh Agarwal, Sumit Tiwary, Vikas Narnoly, Syed Saiful Haq, C Siddartha Sankar, Prasenjeet Dutta, Gaurav Kshettry. Row Four: Arnab Kumar Gupta, Shripal Meghani, Shobhit Kumar, Debabrata Bagchi, Aditya Dasgupta, Soumya Kanti Bose, Piyush Priyadarshi, Vikrant Deoras. Row Five: Priya Gautam, Anurag Naidu, Gulshan Singh Jagdev, Uday Goel, Amit Bansal, Shiju Rajan, Trishit Mazumder, Sriram Varanasi, Saikat Das. Row Six: Monal Chand, Kunal Sinha, Sriram Rajagopal, Himanshu Shekhar, Dharmesh Parikh, Shantanu Singh, Abhishek Singh. Row Seven (Top): Nalin Nandrajog, Suvrath Mahadevan, Ranjit Singh, Freddy B Zarolia.